In 2015, Matt Connor graduated from Dallas International with an M.A. in World Arts and an Applied Arts concentration. 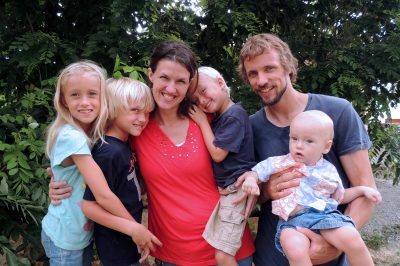 Now he serves in Indonesia with his wife Chelsea and their four children. Their main area of service is in Scripture engagement, helping people experience the powerful, healing impact of the Scriptures in their heart language through their culture’s own art forms and training them to pass these “eternal riches” on to others. Matt, along with fellow Dallas International alumnus Matt Menger and a growing group of Indonesian colleagues, also facilitates songwriting workshops, leading Indonesian believers to write Scripture-based songs using their local language, music styles, and instruments. In addition, he trains them to facilitate their own songwriting workshops and recordings. In June 2016, for example, teams from seven different language groups met at an orphanage on the island of Kalimantan. Together, they wrote and recorded over 40 new Scripture songs in their heart languages! Also, through that experience, the Lord brought one of the workshop participants to Himself: an accomplished lute player, who suffered terrifying dreams every night and was troubled by evil spirits. Toward the end of the workshop, after asking some of the pastors to pray with him, he joined God’s kingdom and even chose to burn some of his fetishes and his notebook of spells! Matt said, “That night, he slept peacefully and the next day, he played the lute for the closing ceremony” (see song link below). Weeks later, one of the songwriting teams from that workshop told Matt that the songs they’d written had been “accepted with joy” back at home and had already been used in three different events! Praise God! During April and May of 2017, Matt lead two more songwriting workshops, three trauma healing trainings, and two parenting trainings. Pray for our Heavenly Father’s wisdom and strength for Matt, his family, and colleagues in all these ministries, especially in training local believers to continue these ministries.